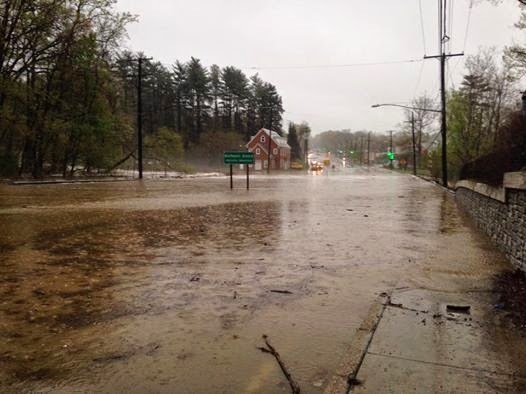 The bridge carrying Route 29 over Northwest Branch is covered in water. The torrential rain we have had over the past two days has caused Northwest Branch to breach its banks and flow over the bridge in Burnt Mills by the old WSSC buildings. This has not happened since June of 2006 (I'm almost certain). As most people know, Route 29 is a major commuter route in eastern Montgomery County. When it gets closed in both directions, traffic in the whole area feels the ripples effects. Traffic can be expected to be horrible in Four Corners (worse than it usually is) until it reopens. The flooded bridge this afternoon (4/30/14). Photo courtesy of Ken Hawkins. Have you ever crossed under the Beltway while using the Sligo Creek Trail? If you have, you will know that there is a nice grassy area north of the Beltway between Forest Glen Road, Holy Cross Hospital, and the creek. If you have lived in Four Corners a long time, you will remember that the bridge carrying the Beltway over the Sligo Creek Trial used to be ridiculously large for the size of the trail it crossed. If you've lived in the area for a really long time, you will remember when the Beltway had exit numbers that were sequential instead of mileage based. Georgia Avenue used to be Exit 23, and Colesville Road used to be Exit 21. So what was exit 22? The large bridge that carried the Beltway over the trail (before being replaced in 2001) was not built to carry the Beltway over a path; rather, it was built to carry the Beltway over a six lane limited-access highway. That grassy area next to the hospital is not there by accident; it was supposed to be the site of an extensive freeway interchange. The omission of Exit 22 was not a mistake; it was supposed to be the future exit number for the Northern Parkway. 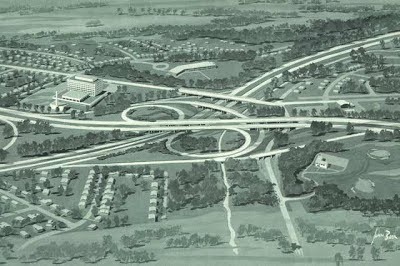 This was the proposed interchange of the Northern Parkway and the Capital Beltway. Holy Cross Hospital is center left (note the smokestack). Sligo Creek Golf Course is at right. The Beltway is the highway running from left to right, and the Northern Parkway is the one running from bottom-left to top-right. The Boys and Girls Club (building with rounded roof) is also visible along Forest Glen Road. Image from Douglas Willinger's blog "A Trip Within The Beltway". The Northern Parkway would have traveled from the North Central Freeway (planned I-70S/I-270) in the vicinity of Woodside through Silver Spring, Kemp Mill, Wheaton, and Glenmont to its terminus at the Outer Beltway (today's ICC) in Northwest Branch Park near the Trolley Museum. The road would have been built to full interstate standards, and it may have carried an interstate designation, but it did not get far enough through the planning stages to receive a number (it probably would have been numbered I-370, more on the reasoning for that later on). The part of the highway that would have affected Four Corners is its route along Sligo Creek from Woodside to Kemp Mill. As seen in the photo above, the road would have had an interchange with the Beltway next to Holy Cross Hospital. For many years, there was a green sign at this location denoting a "Future Exit". This interchange would have been uncomfortably close to the current Georgia Avenue interchange, and the Northern Parkway interchange probably would have required extensive reconstruction had this road actually been built. See map below for the routing of the parkway. The WPCA, Northwood Four Corners Civic Association, and South Four Corners Citizens' Association are jointly sponsoring the County Council District 5 Candidates Forum on Wednesday, May 7th from 7:00 PM - 9:00 PM at Pinecrest Elementary School, 201 Woodmoor Drive. The forum will present an opportunity for Four Corners area residents and business owners to discuss major topics affecting our communities' future and quality of life. All 5 Candidates will be participating. The Long Branch Trail is a paved shared use path that connects to the Anacostia Tributary Trail System. It currently runs from the confluence of Sligo Creek and Long Branch Creek in Takoma Park to it's terminus at Piney Branch Road in Long Branch; the community of homes and apartments that takes its name from the eponymous creek. The creek continues north for another mile to its headwaters just south of Franklin Avenue in Indian Spring. The creek is lined with a thin riparian buffer (woods and undergrowth separating it from adjacent development) for most of its route. North of Piney Branch Road, the creek does not have any recognized trail running alongside it, though there are some dirt trails that parallel the creek all the way to its origin in Upper Long Branch Park. Long Branch Creek along Wilmer Street in Indian Spring, just south of its headwaters. Photo by the author. I think the current Long Branch Trail should be extended to Franklin Avenue as a paved path, then continued on-street through Indian Spring to a potential pedestrian bridge over the Beltway at Indian Spring Terrace Park, and then through the campus of Blair High School to the intersection of Colesville Road and University Boulevard. Click on the interactive map below to get a visual reference of the potential extension. Hello all. I've been taking a brief hiatus from blogging for the past two weeks to get some other stuff done, and I had planned to make a return post about this lovely Spring weather. But then I read some comments on local listerv that claimed that the Woodmoor Shopping Center would be completely and totally destroyed in order to accommodate BRT on University Boulevard and Colesville Road. I hoped that this was an isolated misconception, but to my surprise, it seems a great many people believe this untruth. I do not like scare tactics, and I also don't like people who extort the ignorance of others by using such scare tactics, so I decided had to clear this up. The not-going-anywhere-anytime-soon Woodmoor Shopping Center. Photo by the author. I am not sure how this myth started, but it certainly alarms people who are unfamiliar with the BRT plans. I assume its origins are in another myth I have heard about BRT: the thought that BRT will require 150 feet of additional right-of-way on local roads. For some reference on that number, the width of the Beltway from shoulder to shoulder through Four Corners is less than 150 feet. BRT buses are between 8 and 9 feet wide, so the 150 number seems a bit extreme.